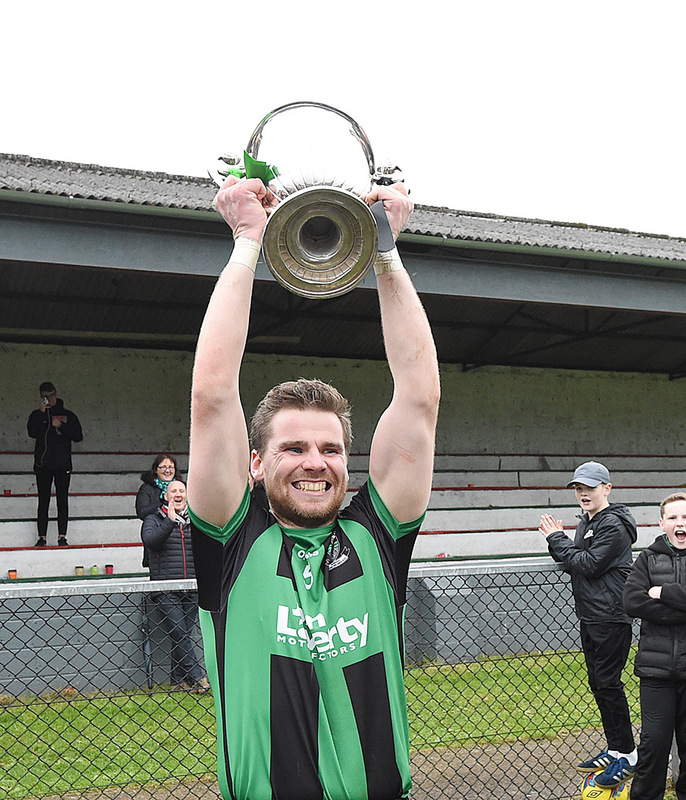 Dundalk Young Irelands won their third championship title since 2007 in Dowdallshill on Sunday afternoon, sending Glyde Rangers to a second successive junior final defeat. Mark Savage’s second half goal will be what the decider is ultimately remembered for, but even that came in scrappy circumstances after his original penalty attempt had been saved low to David Brennan’s left. The loose ball fell kindly for the Irelands’ No. 14 and he slid it to the net, an incident which typified the telling influence of lady luck on the day. It was a dour spectacle in which no player can claim to have performed to anywhere near their best, with the slippery conditions and the magnitude of the occasion failing to help either side in their efforts. Glyde were arguably the better of the pair having controlled the first half in almost its entirety. But, just like they did against Glen Emmets 12 months ago, they were guilty of passing up too many scorable opportunities, especially at the death. Brian Duffy had the goal at his mercy with men steaming inside. He should have stroked the ball over to send the match to a replay, but attempted for the glory pass - which, if successful, could have altered the game's fate. However, Peter Nixon, from nowhere, fractured the move, reaching his right hand into the clouds and clawing the airborne leather away. It was an heroic, championship-saving intervention. The drama wasn’t concluded though, as, with practically the final kick, Ciaráin Sheridan dragged his ‘45 attempt off target, as Glyde’s season ended in ultimate disappointment. There was a typical final paradox on the field at full-time. Many of the sky blues lay crestfallen, whereas Young Irelands’ rejoiced, both before and after Aidan Shevlin’s closing whistle, with a premature invasion having taken place. Selector Kieran Maguire - a Young Irelander to the core - had his sons, Derek and Dean, playing and was almost overcome with emotion: “I’m delighted. The Irelanders, it’s in our family. “We eat football in our household. The boys will tell you at times that they won’t want to come home if they played badly because they’ll be told so. Glyde were utterly dominant in the second quarter, having got off the mark through a Trevor O’Brien free on 17 minutes, but they dropped two further attempts short and fired three wides. Their tally of miscues finished at a telling nine, too many of which came in the closing stages. Young Irelands trailed, 0-3 to two, at the break, despite having been aided by the breeze which moved towards the dressing room end, but they had the consolation of knowing they could play no worse, and so it proved. Their play became less erratic with manager O’Donoghue’s interval address fresh in mind and although still offering possession to Glyde cheaply, their waves of attack wore the Tallanstown natives into a state of frustration. And, to some degree, the winners capitalised, scoring their only two points of the second half from frees, via Jordan O’Donoghue and Dermot Mone, which followed Savage’s goal. Mone was the claimant of the penalty after being hauled down by Fiachra Sheridan. Referee Aidan Shevlin, who was generally consistent in his officiating, particularly considering the frantic nature of the finish, rightly spread his arms. Startlingly, the winners went 24 minutes in the first period and 22 in the second without a score, but what they were able to muster shortly after half-time ultimately proved enough. Glyde committed bodies to attack, almost knowing that Irelands were content with what they had posted, and introduced Conor Sheridan approaching the final quarter. His absence from the start, due to the birth of his child, meant a distinct lack of creativity in his team’s attack. The type of ingenuity which Derek Maguire, although guilty of some poor passing, and O’Donoghue produced down-field. Glyde will wonder how they lost this one and, equally, Young Irelands know they were fortunate. But, then again, they narrowly avoided carnage against Roche Emmets in the semi-final when Fergal Sheekey was the hero. Their name was just pre-inscribed on Christy Bellew, as it was in 2007. Champions of both junior league and championship, and worthy.